You may have heard the term “hydrophilic catheter,” and your doctor may have even discussed some of the features of this type of newer-technology product. But are you still left with some questions as to how to use a hydrophilic catheter? Or perhaps you wonder what the benefits of using this kind of device could be for you. 180 Medical makes it a point to be an available source of knowledge for you, so we’ll try to help shed some light on this topic. For many years, the most common type of catheter has been the straight catheter, which is most often manually lubricated with a separate form of sterile lubrication jelly. While this is a great option that is certainly tried and true, some people still experience some pain, pressure, and discomfort during the catheterization process, due to the lubrication sloughing off of the catheter during insertion or withdrawal. Hydrophilic catheters were created in part to help with this very situation, as well as offer a more convenient and quick solution for catheterization on the go. These catheters have a layer of coating of pre-lubrication that is bound to the surface of the tube itself, so that once the lubrication is activated, it will not slough off. Hydrophilic catheters are activated by water or sterile saline solution, which may be present in the catheter package itself or in a separate foil packet. The pre-lubricated coating absorbs water during the activation period and creates a smooth, slippery surface perfect for giving a smooth and comfortable catheterization experience. The coating layer remains intact upon introduction into the urethra and ensures lubrication of the urethra in its entire length. How do I use a hydrophilic catheter? Hydrophilic catheters are activated by water or sterile saline solution, which may be present in the catheter package itself or in a separate foil packet. If the catheter has a packet, you must burst it to release the water and activate the hydrophilic properties of the catheter. In order to do this, simply fold the water packet at the middle and apply pressure with your thumb and forefingers. This should release the solution. 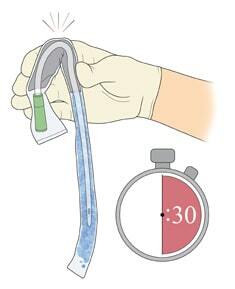 Depending upon the brand of catheter, you’ll usually allow approximately 15 to 30 seconds for the solution to fully coat the catheter and activate the hydrophilic coating. At this point, it should be ready for you to insert into the bladder, as you would normally. 180 Medical also offers one-of-a-kind educational materials with step-by-step instructions, such as our 180 Medical DVD and our How to Cath Booklets for both men and women (offered in English and Spanish). We also have unique and helpful booklets just for kids that help to make the catheterization process more normal and less scary for children and their caregivers/parents. These great booklets also offer instructions and fun activities. Contact us today if you have more questions! Interested in the latest intermittent catheters to come on the market? Read on to discover more about Hollister’s Essentials intermittent catheters. Do you have difficulty using straight catheters? There is another option that may be right for you. Learn more about coude catheters here.